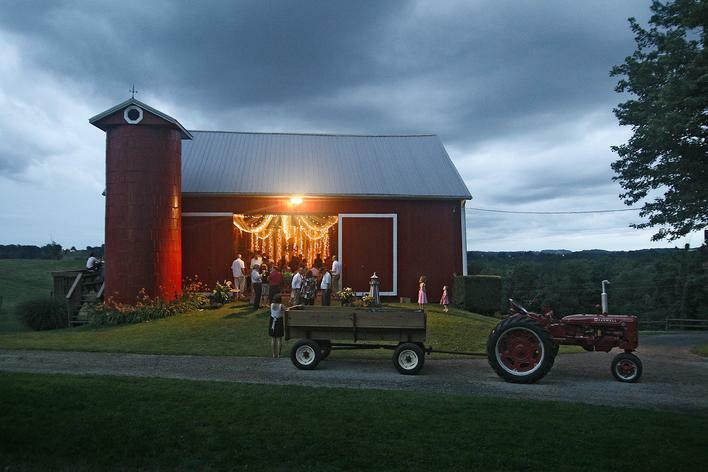 Granddaughter Katie married Josh at the farm in July, with a rousing reception in the barn. 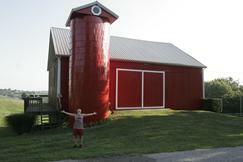 Granddaughter Liz rejoices as we finish painting the barn in July 2011. Click on the photo to see a slide show. Indiantree Farm is in the heart of Ohio's Amish country. The farm sits on land where generations of our family have lived for more than 200 years. Click through our site for information about the farm and nearby sights in and around Holmes County -- the largest Amish community in the world. NOT TO BE MISSED: See updates of Larry's Amish Country Journal, which gives a whimsical, poignant look at life in the Amish community. So you think you're tough?! So you think you’re tough . 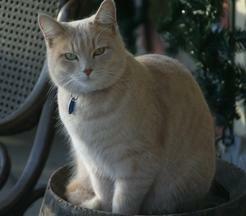 . . sitting there on your inner-city stoop, listening to the rhythm of the drive-bys on the next block? Think you’re tough . . . watching Bruce Willis “dying” hard and telling yourself, “Yah, I could do that”? Or . . . nursing a paper cut and trying to decide if you can finish work at the office or go home early. 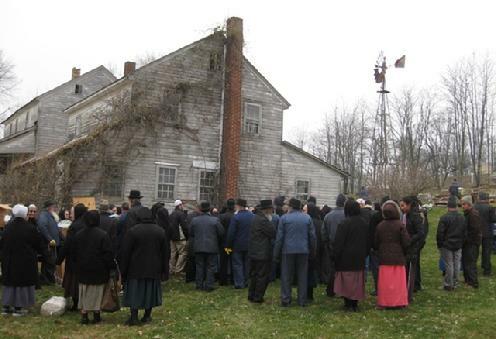 I’ll tell you what’s tough: A quiet Amish man who gets run over by a 1,000-pound planter, is impaled by one of the planter’s steel plow shoes and is then dragged 80 yards by a team of four spooked horses. It’s tough to choke back the tears when you arrive at the edge of the field and see how crumpled your friend is. It’s tough driving 12 miles through the tourist clog in Amish Country with him quietly groaning at every pavement joint, crack or pothole. And what a relief to pull up to the ER, where a doctor, two nurses and a gurney are waiting, thanks to the modern miracle called a cell phone. They did a quick check, stabilized him and shipped him off in a screaming ambulance to a big-city trauma center. His injuries were severe. He had six broken ribs, several deep wounds requiring a lot of cleaning and many stitches. Oh, and a severe concussion. And two weeks later, as I strolled in the yard behind the Indiantree Farm guesthouse, I heard a familiar sound in the hayfield a few yards away. There he was — dusty bandages aflutter — throwing 50-pound bales of hay from the ground to a horse-drawn wagon piloted by his daughter. They filled the wagon six times that evening. That, my friend, is tough. Also see candid photos from our barn-painting project! 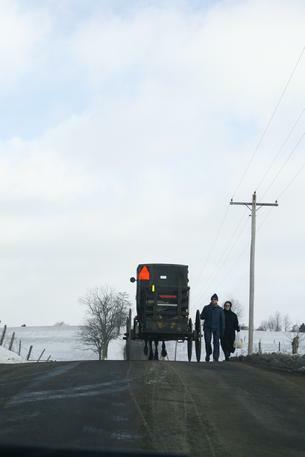 Fresh photos from Amish country: Click on this photo for a winter 2010 slide show. The biggest event in Walnut Creek on Saturday, Nov. 20, 2010, was the auction at Sara Troyer's place. Click on the photo for a slide show. 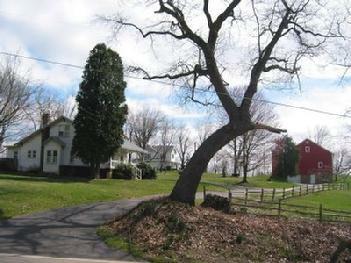 Indiantree Farm is named for the arched oak at the end of the lane. It's believed that native Americans bent the tree as a sapling more than 200 years ago to mark a foot trail. The guest house is to the left of the tree. 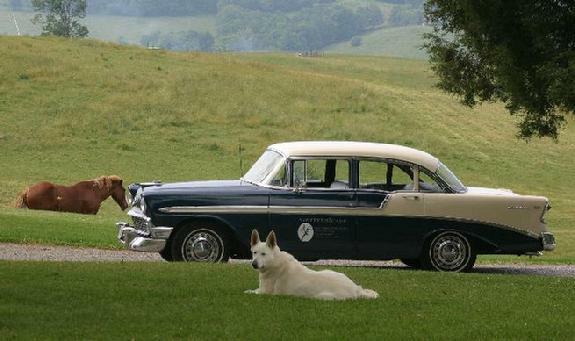 Faithful dog Pilgrim hangs out near the Indiantree '56 Chevy Bel Air. Check out a fun video of our son's cat scratching at the window.